Previously we mentioned about Doc Fetcher that can help you to scan and retrieve related documents from Windows PC, but if you think the solution is too heavy and is looking for something lighter, here is a tiny utility that you can consider. 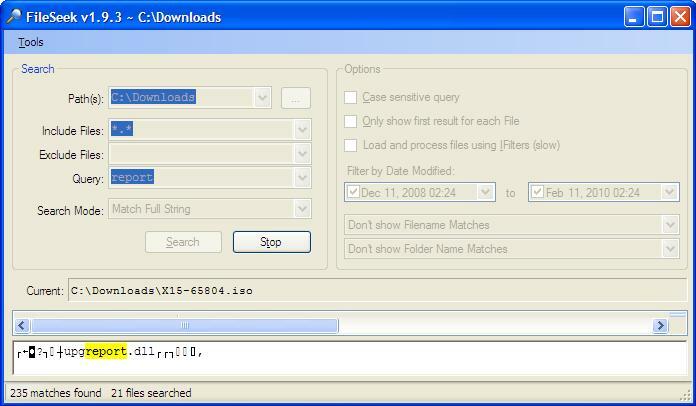 Named as FileSeek, it is a Windows based utility that can locate your desired files by scanning through any of your system folders/subfolders with customizable search mode and options. Once install and launch the utility, users will be brought to a simple GUI. For the start, just browse to specific path(s) where you believe the related files could be in. After that, there are additional options that could customize the search feature, making the search functions with more accurate and desirable results. For instances, users can choose to match full string, match any word or all words with inclusion or exclusion of certain file types and many more. On top of this, users can play around with the range of files’ modification date so that the list of search results can be shorten with right keyword in the query field. Once all are set correctly, click on ‘Search’ button will display all the related files with file name, path, line number of where the keyword has been found as well as date modification ready for retrieval by clicking on the link directly or in preview mode. Compatible to run in Windows Operating System and consume less than 650kB, users can get a free download here as a great alternative to much heavier but feature-rich Doc Fetcher tool.